To improve health and maximize vitamin and mineral intake, you should eat a rainbow of fruits and vegetables each day, according to food and nutrition specialist Julie Garden-Robinson. While this statement might conjure up images of red strawberries and purple cabbage, you might want to take a look at the rainbow of colors potatoes come in. Eating a colored potato every now and again can certainly help vary your nutrient intake. 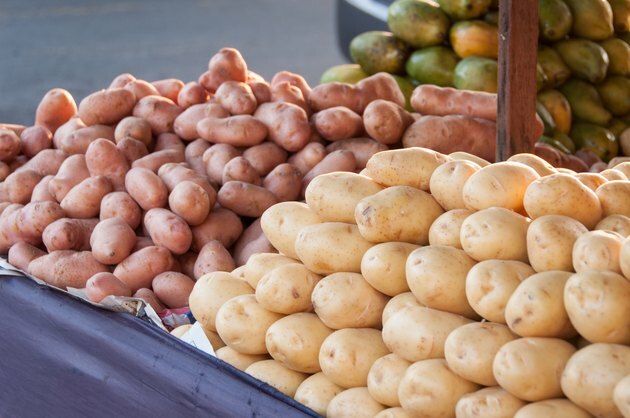 While the nutritional profile of the red and yellow potato are similar, there are some differences that may make you decide to eat one over the other. If you're looking for a lower-calorie potato, the red potato slightly hedges out the yellow potato. An 85-gram portion of a red potato, which is about 1/2 cup, contains 70 calories, while the same size serving of a yellow potato contains 77 calories. Seven calories may not sound like much of a difference, but saving a few calories here and there can add up over the course of a day, which is especially important given that most Americans eat more calories than they need, according to the 2010 Dietary Guidelines for Americans. Protein, Fats and Carbs -- Oh My! When it comes to protein, fat and carbs, a red potato is lower in carbs and a better source of protein than a yellow, and both are fat-free. An 85-gram serving of a red potato contains 2 grams of protein, 15 grams of carbs and 1 gram of fiber, while the same serving of a yellow potato contains 1.5 grams of protein, 19 grams of carbs and 1 gram of fiber. However, if you're watching your carbs for blood sugar control, the yellow potato may make a better choice, with a glycemic index of 58 for a boiled yellow variety versus 89 for a boiled red. A food with a high GI -- 70 or greater -- raises blood sugar more than a lower GI. Still, GI for even the same potatoes varies greatly depending on country of origin, according to the U.S. Potato Board. Antioxidants are substances that protect your cells against damage and may help prevent or delay the onset of chronic illnesses such as heart disease or cancer. Both yellow and red potatoes are a good source of antioxidants. In fact, the red and yellow coloring is responsible for some of its antioxidant power. While both potatoes are an excellent source of vitamin C, the red potato is richer in anthocyanins and the yellow potato carotenoids. The red potato may may be lower in calories and carbs, but the yellow potato is a better source of iron and calcium. An 85-gram serving of a yellow potato contains 1.3 milligrams of iron and 15 milligrams of calcium, while the same serving of red contains 0.7 milligram of iron and no calcium. Iron is needed to make red blood cells, and calcium is important for bone health. Adult men and women over age 50 need 8 milligrams of iron a day, and women between the ages of 19 and 50 need 18 milligrams of iron a day. Calcium needs for adults range from 1,000 to 1,200 milligrams a day.